Choose a method to provide the driver update, and refer to Section 7.2.1, “Preparing to use a driver update image file”, Section 7.2.2, “Preparing a driver update disk” or Section 7.2.3, “Preparing an initial RAM disk update”. Note that you can use a USB storage device either to provide an image file, or as a driver update disk. During installation, you cannot provide driver updates on media that is read by a device with a SATA or SCSI connection. For example, if the only optical drive on your system is a DVD drive with a SATA connection, you cannot provide a driver update on CD or DVD. Note that if you use this method, the storage device will contain only a single file. This differs from driver update disks on formats such as CD and DVD, which contain many files. The ISO image file contains all of the files that would normally be on a driver update disk. Refer to Section 7.3.2, “Let the installer prompt you for a driver update” and Section 7.3.3, “Use a boot option to specify a driver update disk” to learn how to use the driver update disk during installation. If you change the file system label of the device to OEMDRV, the installation program will automatically examine it for driver updates and load any that it detects. This behavior is controlled by the dlabel=on boot option, which is enabled by default. Refer to Section 7.3.1, “Let the installer automatically find a driver update disk”. To make the ISO image file available on a local network, place it in a publicly accessible folder on a HTTP, FTP, or NFS server. If you plan to use an image file that is already publicly available through the Internet, no special preparation is necessary. In either case, take note of the URL and verify that you can access the file from another machine on your network before commencing installation. Refer to Section 7.3.2, “Let the installer prompt you for a driver update” and Section 7.3.4, “Use a boot option to specify a driver update image file on a network” to learn how to specify this network location during installation. 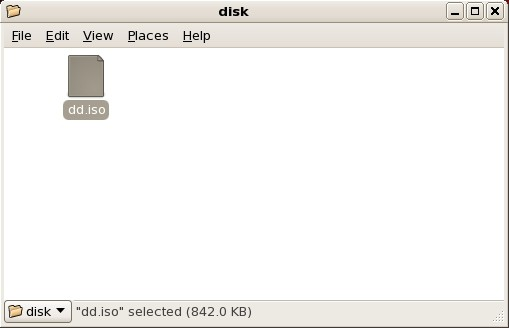 CD/DVD Creator is part of the GNOME desktop. If you use a different Linux desktop, or a different operating system altogether, you will need to use another piece of software to create the CD or DVD. The steps will be generally similar. Make sure that the software that you choose can create CDs or DVDs from image files. While this is true of most CD and DVD burning software, exceptions exist. Look for a button or menu entry labeled burn from image or similar. If your software lacks this feature, or you do not select it, the resulting disk will hold only the image file itself, instead of the contents of the image file. Use the desktop file manager to locate the driver update ISO image file supplied to you by Red Hat or your hardware vendor. Click the Write button. If a blank disc is not already in the drive, CD/DVD Creator will prompt you to insert one. If you see only a single file ending in .iso, then you have not created the disk correctly and should try again. Ensure that you choose an option similar to burn from image if you use a Linux desktop other than GNOME or if you use a different operating system. The following procedure assumes that you are creating a driver update disk using Linux. To create a driver update disk using a different operating system, you will need to find a tool that can extract files from ISO images. You must then place the extracted files on a removable disk or USB storage device. If you perform this procedure with a disk or USB storage device that already contains data, this data will be destroyed with no warning. Make sure that you specify the correct disk or USB storage device, and make sure that this disk or storage device does not contain any data that you want to keep. 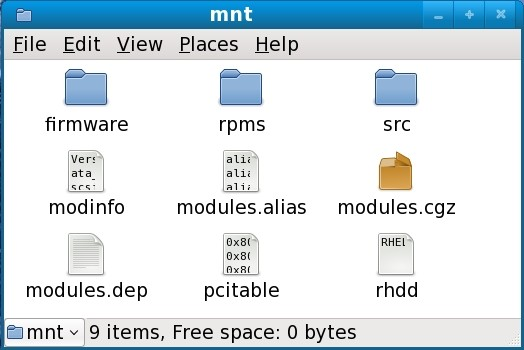 Insert a blank, formatted floppy disk into an available drive, or connect an empty USB storage device (such as a USB flash drive) to your computer. Note the device name allocated to this disk, for example, /dev/fd0 for a floppy disk in the first floppy drive on your system. If you do not know the device name, become root and use the command fdisk -l on the command line. You will see a list of all storage devices available on your system. 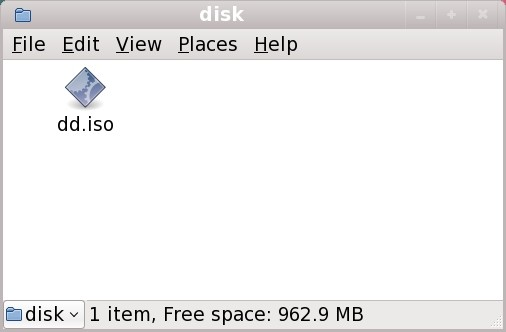 Compare the output of fdisk -l when the disk inserted or the storage device is attached with the output of this command when the disk is removed or the storage device is disconnected. At the command line, change into the directory that contains the image file. After you create a driver update disk, insert it (if you used a disk) or attach it (if you used a USB storage device) and browse to it using the file manager. If you see a list of files similar to those illustrated in Figure 7.4, “Contents of a typical driver update disc on CD or DVD”, you know that you have created the driver update disk correctly. This is an advanced procedure that you should consider only if you cannot perform a driver update with any other method. The Red Hat Enterprise Linux installation program can load updates for itself early in the installation process from a RAM disk — an area of your computer's memory that temporarily behaves as if it were a disk. You can use this same capability to load driver updates. To perform a driver update during installation, your computer must be able to boot from a preboot execution environment (PXE) server, and you must have a PXE server available on your network. Refer to Chapter 34, PXE Network Installations for instructions on using PXE during installation. Place the driver update image file on your PXE server. Usually, you would do this by downloading it to the PXE server from a location on the Internet specified by Red Hat or your hardware vendor. Names of driver update image files end in .iso. Copy the driver update image file into the /tmp/initrd_update directory. Rename the driver update image file to dd.img. Copy the file /tmp/initrd_update.img into the directory the holds the target that you want to use for installation. This directory is placed under the /tftpboot/pxelinux/ directory. For example, /tftpboot/pxelinux/r5su3/ might hold the PXE target for Red Hat Enterprise Linux 5.3 Server. Where target is the target that you want to use for installation. Refer to Section 7.3.5, “Select a PXE target that includes a driver update” to learn how to use an initial RAM disk update during installation.